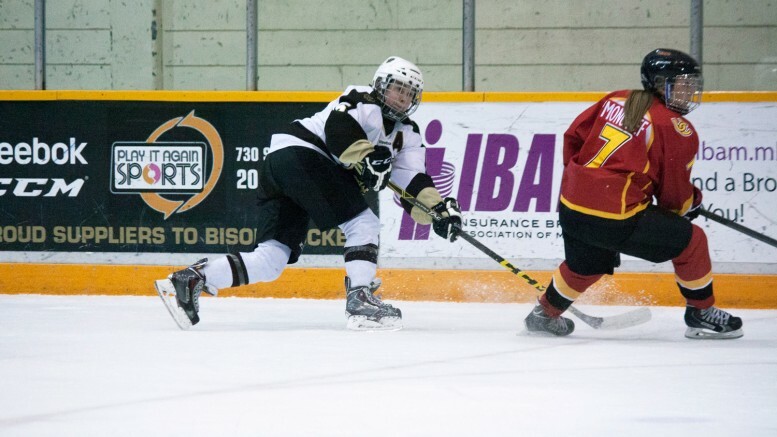 The Manitoba Bisons women’s hockey team is on back on track after a jittery start to the 2015-16 season. The hosts topped the Calgary Dinos last weekend to improve their record to .500, producing 3-2 and 5-0 wins, respectively. Tasmine Hemmingway stood out for the herd in game one, scoring two goals, while Finnish international Venla Hovi potted four goals on Saturday. It took just over five minutes for the Bisons to open the scoring on Friday. Hemmingway’s deflection on Celine Caron’s shot eluded Dinos goalie Carissa Fischer for her first goal of the season. Calgary, who was 1-5-2 to start the game, responded just 1:32 later when Megan Grenon’s shot from the slot beat Bisons goaltender Rachel Dyck. A second Hemmingway goal capped off a wild first period on a questionable goaltending decision from Fischer. The six-foot forward was able to dispossess Fischer, who had wandered out of her crease to play the puck, and capitalized to retake the lead for Manitoba. The goal marked the end of the night for the Calgary starter – who gave up two goals on three shots and was pulled for CIS rookie Sarah Murray. Just two minutes into the second period, the Dinos started to show signs of life. Russian forward Iya Gavrilova struck shorthanded to tie the game at two all. Hemmingway continued to be a standout presence in the third period. She played a part in a late rush from the Bisons, leading to Nicole McGlenen’s game-winning goal with three minutes left to play. The Bisons improve to 4-5-0 after their victory, outshooting the Dinos 19-13. Coach Jon Rempel was quick to praise Hemmingway on her rampant performance. Finnish Olympian Venla Hovi – who was recruited ahead of the season – was dominant on Saturday. She scored shorthanded to get Manitoba on the board just two minutes into the game. Six minutes later, it was Hovi capitalizing again, this time on a two-on-one opportunity. The Bisons made it 3-0 six minutes into the second period when Courtlyn Oswald beat Murray from an awkward angle for her first goal of the season. Hovi completed her hat trick just a minute later on the man advantage. If scoring three goals in her fourth CIS career game was not satisfactory enough, the 2010 Olympic bronze medalist with the Finnish national women’s team added one more for good measure, just 38 seconds into the third period. Perhaps the Bisons will be looking overseas for hockey recruits more often in the near future, with Hovi being Rempel’s first ever international recruit. Goalie Amanda Schubert stopped all 14 shots she faced for the 5-0 shutout in the game promoting cancer research awareness. Cancer Care Manitoba also received a $2,000 donation from the Bisons during the postgame. Rempel noted the importance of the team’s recent improvements postgame.